For that kind of cheese, you'll want to be sure that your precious purchases are chained down, lest they fly off the mountain. 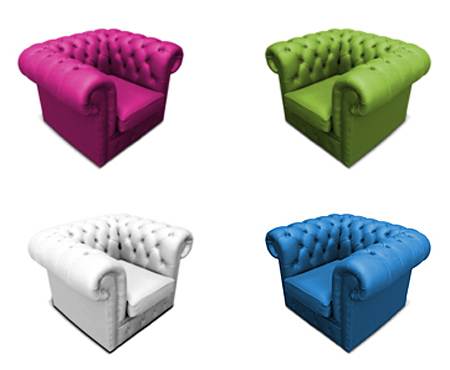 Of course, JSPR's plastic chesterfield chairs are my favorites because, as the Nerdy Fashionista knows, I loves me the tufting! 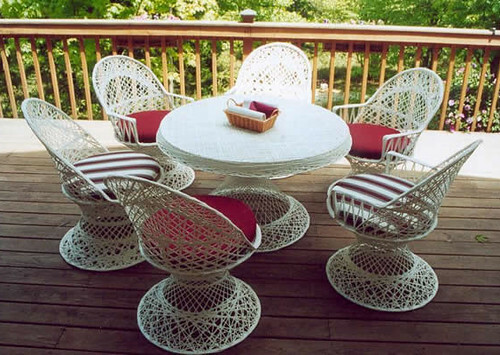 Holy hell these guys are expensive, but since they're woven from resin wicker on a powdercoated aluminum frame and topped off with Sunbrella cushions, at least you can be sure they won't melt into a puddle of moldy ooze. Via Home Infatuaton. Ok, on to some chair and table sets, most of which are actually -- gasp! -- affordable. 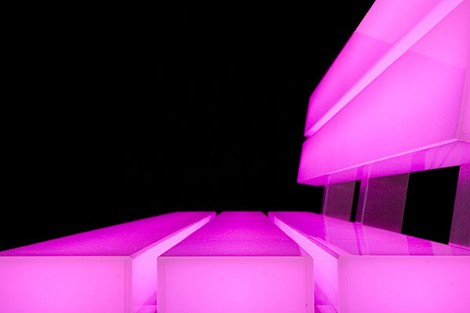 Yes, it's a new day for Design Crisis. 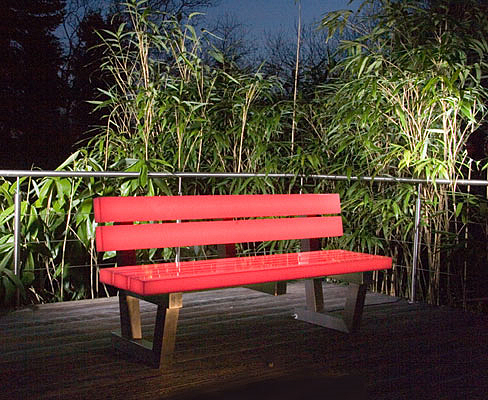 There aren't a lot of choices in terms of materials for outdoor furniture, but lately designers have been making the most out of plain old plastic, and I love the lines and variety of color choices on all of these. 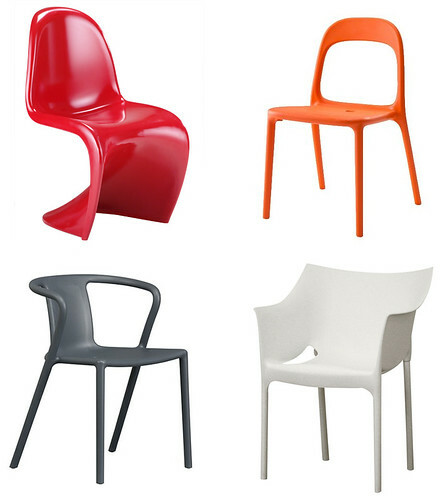 Clockwise from top left: Reproduction of the historic Panton S Chair, $260 for a set of two from Advanced Interior Designs, Ikea's Urban Chair for only $40, Philipe Starck-designed Dr. No Chair, $263 each from Hive, Air Arm Chair designed by Jasper Morrison at CB2, $149 each. 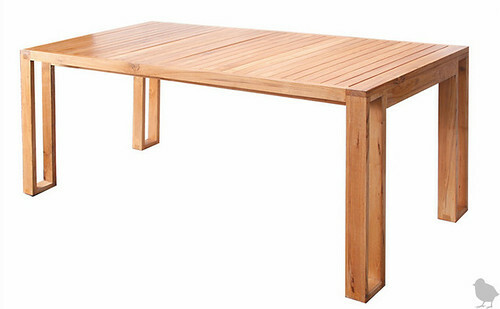 If you like this look but not the expense, shop around for local dealers who might carry some of the cleaner teak designs. 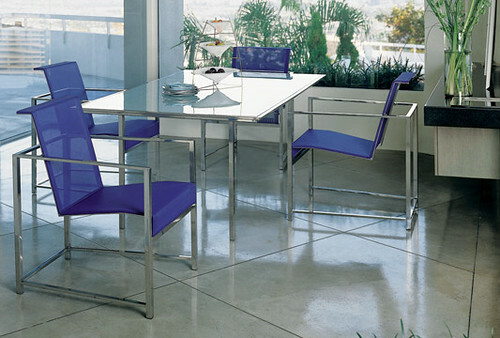 Just choose something without all the extra business going on underneath... let the chairs do all the talking. It's a bit hard to see here. but that red powdercoated and welded metal x-base is pretty hot, and glass is definitely waterproof (if messy). Not bad for $399. 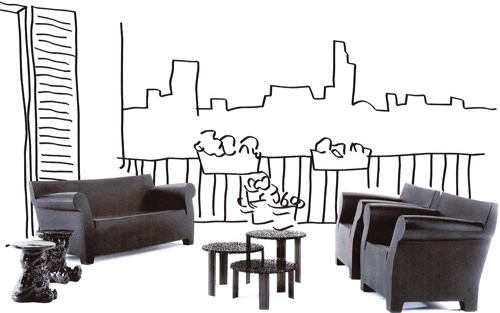 Brown and Jordan have been making sleek and fabulous patio furniture since the birth of exterior design, and they do it well. And expensively. But occasionally you can find a nice set of Brown and Jordan secondhand, and I particularly like their 70's designs. 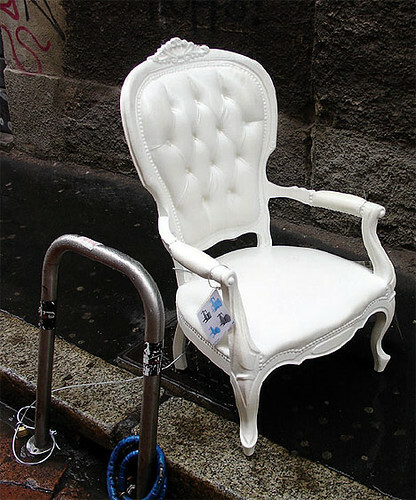 The chairs are very Kelly Wearstler, and overall I think the set has an ornate tulip table feel. Just not with the striped cushions!!! 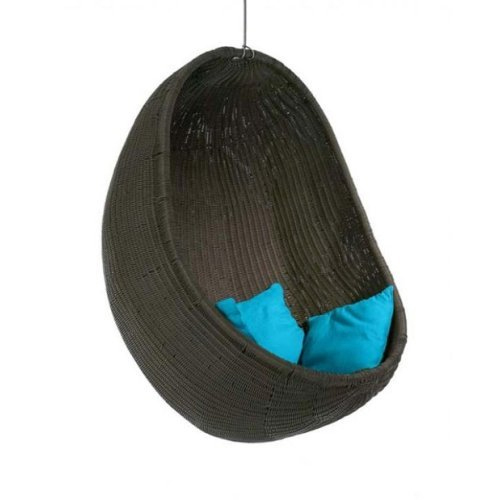 For a more traditional setting, this set from Overstock could work well with some punchy cushions. 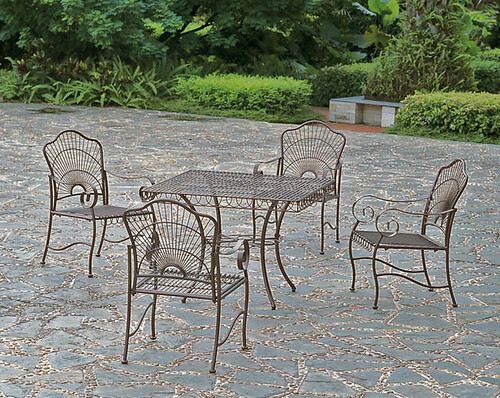 At $440 including tax and shipping, it's priced well for wrought iron. 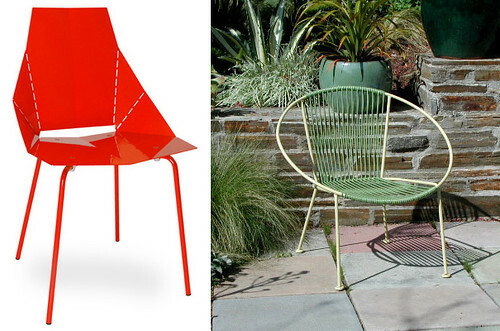 I like the idea of either the folding red metal chair by Blu Dot (sold by Hive Modern for $129 each including shipping!) 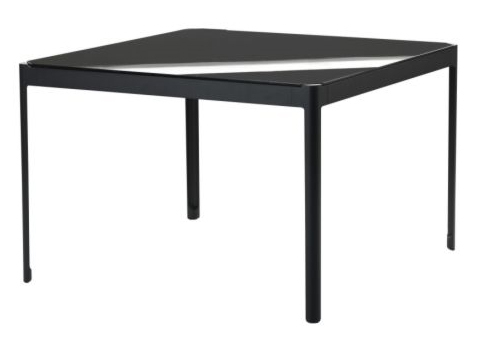 or the fabulous steel and vinyl cord hoop chair sold by Plain Air (which I think is about $400 each, although you may be able to find a vintage Salterini patio chair with a similar form for less) with this simple metal and tempered glass table from Ikea for $199. 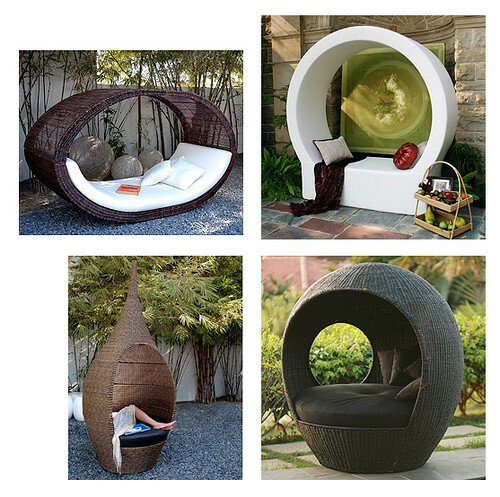 First, I need the plastic polymer Bubble Couch and Bubble Chairs designed by Philipe Starck and sold at Hive. 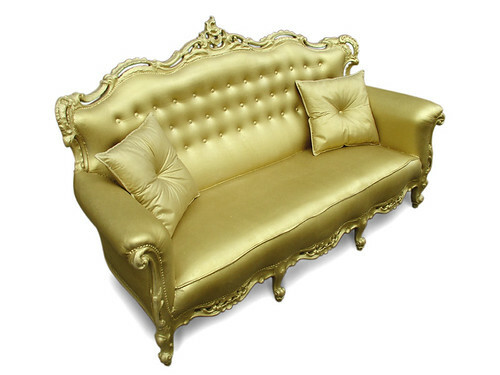 The couch is $1020, and the chairs are $680 each. 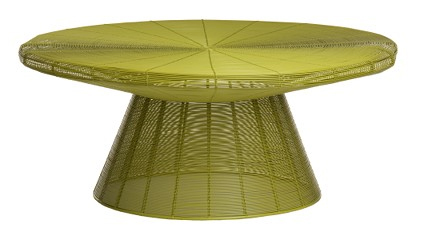 Next, I need this lime green powdercoated steel coffee table sold by CB2 for only $249! 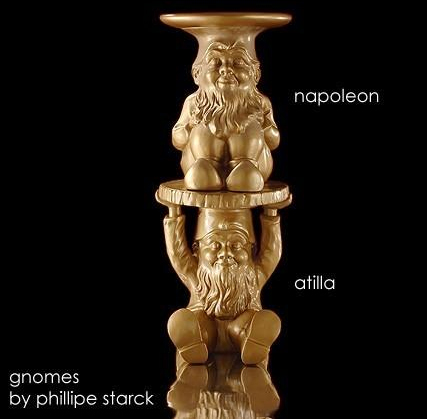 And to cap it off, I'm going Starck again with GOLD LIMITED EDITION gnome buddy side tables, Napoleon and Atilla, $375 each. That comes to a grand total of $3,380. You know, Bubba, that sounds like a fair fee for my time today. I kid! But I won't be sad if you buy me a golden gnome for Christmas.